Indonesia is spread out. This geographically-sprawling republic is scattered over more than 17,000 islands that equate roughly to the size of the United States. It’s big. And its backbone is volcanic. Indonesia boasts more active volcanos than any other country on the globe. 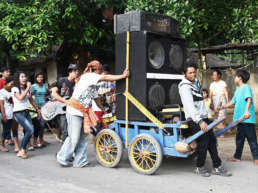 127 burners stretch from Sumatra in the west of the archipelago to far-off Flores in the east. Sitting atop a busy crossroads of some of the world’s most powerful tectonic plates, this geologically young nation has earned its stripes on the deadly Pacific Ring of Fire. 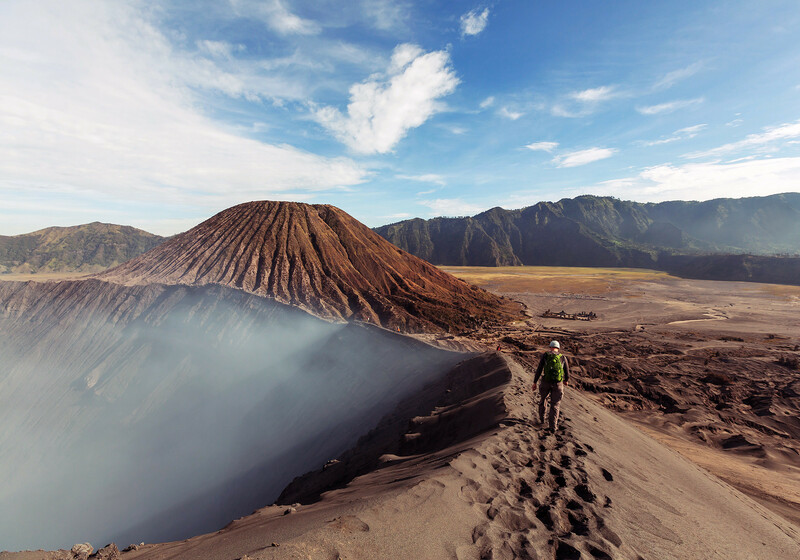 You don’t have to travel very far in Indonesia to bump into a dormant volcano – always a spectacular sight. But watch a volcano erupting, and you can’t help feel that you’ve been teleported back into Prehistory. You half-expect a pair of brontosaurus to sway across the plains and start grazing lazily at the tops of the nearby coconut trees. It’s like witnessing Mother Nature starting from scratch all over again. But Mother Nature having a bad-hair day is always something to stay clear of – and in Indonesia, she rarely works part-time. Most will remember the Indian Ocean Tsunami of 2004 that was generated by a massive undersea earthquake off the coast of Aceh, spreading fear and chaos across the world’s oceans. And despite the tsunami’s horror and other-worldly scale, it wasn’t Indonesia’s only major game-changer to have hit the planet’s headlines. When the hugely volatile Mount Tambora – located on the long, dry, slender island of Sumbawa – blew itself apart in April 1815, it was arguably the world’s largest volcanic eruption in the past 10,000 years. The mountain simply detonated – sending 50 cubic kilometers of magma into the air and displacing 30 cubic kilometers of rock and earth into the surrounding land and sea. Four-kilometer-long islands of pumice were seen floating in the ocean several years later. It also left a crater six kilometers wide and more than a kilometer deep in its fiery wake. Tambora’s self-destruction killed more than 100,000 people at the time; and the ash-clouds blanketing the world’s skies prompted a volcanic winter that changed 1816 into ‘The Year Without Summer’. 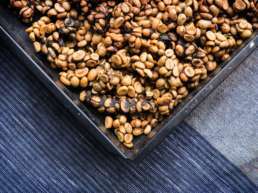 In Europe there was widespread crop-failure, hunger and food riots. Ireland’s ‘Potato Famine’ – a direct result of the explosion – and a subsequent four-year outbreak of typhus led to another 100,000 Irish deaths and a mass migration to the United States. Lake and river ice was seen as far south as Pennsylvania; red snow fell in Italy; torrential rains in Northern India sparked a cholera epidemic that reached as far as Moscow. On the plus-side – there were few – the spectacular sunsets caused by the cloying, atmospheric dust inspired the English landscape painter J.M.W. Turner to give birth to some of his finest works of art. Tambora’s self-destruction killed more than 100,000 people at the time; and the ash-clouds blanketing the world’s skies prompted a volcanic winter that changed 1816 into ‘The Year Without Summer’. Unwittingly, Tambora also changed the political and linguistic face of Europe – and the world – forever. On the final day of the Battle of Waterloo, June 18th 1815, the French Emperor Bonaparte – his cannon and cavalry heavily bogged down by unusually wet weather and thick mud – made the fatal mistake of delaying his final attack on Wellington’s rag-tag army. Napoleon lost the battle – and in doing so lost his entire European empire. If Mount Tambora hadn’t erupted, you’d be reading this in French. So can a butterfly really flap its wings in the Amazon and cause a storm in Texas? Everything’s debatable. When the small volcanic island of Krakatau tore herself to pieces 68 years after Tambora blew her top, she stole her big sister’s limelight. Tambora was bigger. Krakatau’s 1883 eruption was more widely reported as it was one of the world’s first global news events thanks to the newly-invented telegraph. Despite only managing an explosion 13,000 times the nuclear yield of the Hiroshima bomb – far less than her big Sumbawan sister – Mount Krakatau eventually produced a tsunami 46 meters high that leveled the northern Javanese town of Merak along with scores of other coastal settlements in the region. 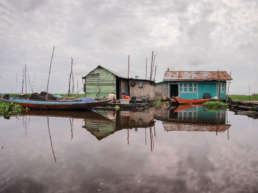 Like the Indian Ocean Tsunami of 2004, inhabitants living either side of the Sunda Strait on the Indonesian islands of Java and Sumatra were initially perplexed by the event. As the first explosion happened, the sea retreated to reveal thousands of fish flapping on the sea-less sand; the natural reaction was to run down and collect them. When the next series of violent explosions and tsunamis occurred, over 36,000 people lost their lives. Some sources put the death-toll at 120,000. Ships as far away as South Africa rocked in their moorings. The pressure wave that tagged along behind the fourth, monstrous explosion travelled at 1,086 km/h and shattered the eardrums of sailors 64 kilometers away. Ash clouds rose more than 80 kilometers into the atmosphere. Pyroclastic flows – currents of super-heated gas and rocks that can reach more than 1,000°C and travel faster than a passenger-jet – raced across the ocean killing at least 1,000 people in Ketimbang on the south coast of Sumatra, 48 kilometers away. The sonic boom produced by the largest, final explosion was heard in Perth, Australia – and as far away as the tiny island of Rodriguez near Madagascar, 4,800 kilometers to the east. A 10-centimeter tidal surge washed up in London’s Thames, and pressure waves from the eruption circled the globe seven times before they finally died out. And the reason why it happened? Krakatau sits directly above the subduction zone – the collision point – where the Eurasian Plate and the Indo-Australian Plate meet head on. Geologically, that’s about as sensitive as the solar plexus. Anak Krakatau volcano spews clouds of hot gasses, lava and rocks into the Sunda Straits between the islands of Sumatra and Java. Driftwood and pumice litters the neighbouring island of Rakata from where the photograph was taken. But there’s no keeping Mother Nature down. In 1927, a new island emerged from Krakatau’s demolished womb. 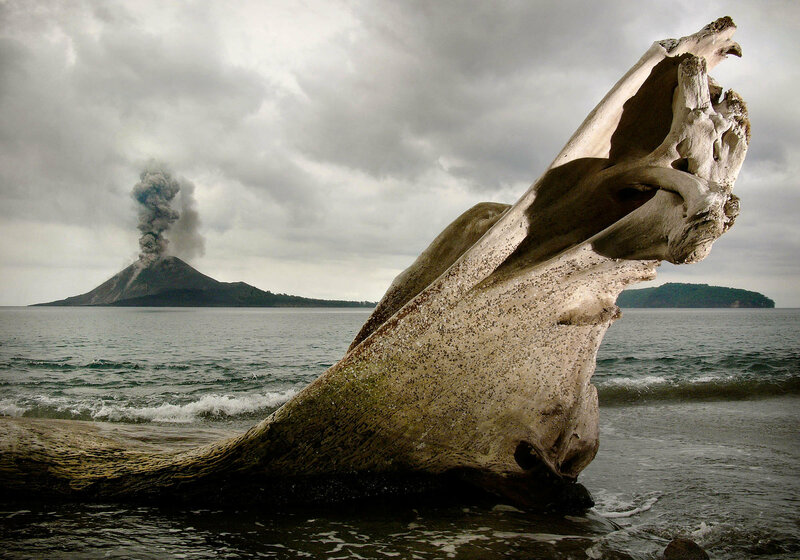 Like a teenager on a growth-spurt, Anak Krakatau – the ‘Child of Krakatau’ – just can’t stop sprouting. And unlike a teenager, she puts on five meters a year. She’s now over 340 meters tall. Her older sister Gunung – Mount – Tambora has also regenerated, and is up to her old tricks again. Which begs the obvious question: why would anyone choose to live next to an active, volatile volcano that might strip them of their possessions, their houses, and even their lives in the blink of an eye? Short-term devastation of an eruption is more than outweighed by the long-term rewards that the inorganic, nutrient-rich volcanic ash brings to the surrounding land. Transported by wind and water, ash packs the earth and – coupled with copious tropical rainfall – makes areas such as Java and Bali some of the most productive farmland in the world. 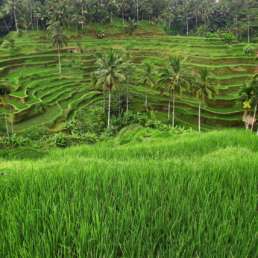 That’s why volcano-rich Java is one of the most densely populated places on earth: farmers can harvest three rice crops a year. 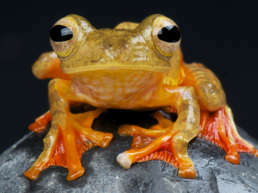 On nearby Kalimantan, which has only one volcano, the soil is significantly poorer – and despite it being five times the size of Java, its population is six times as small. 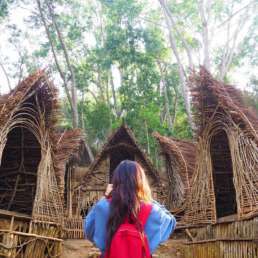 And whereas Kalimantan’s people are historically hunter-gatherers, Java’s and Bali’s lush farmland and copious food provided by the deadly eruptions ironically bought their inhabitants the luxury of time – so that they could concentrate on the arts, crafts and religion. Results rolled in thick and fast. Before the end of the 10th century, the powerful Hindu Kingdom of Mataram – nurtured under the shadow of Mount Merapi in Central Java – had built the sprawling temple-complex at Prambanan. 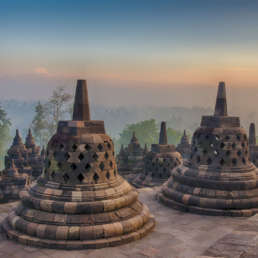 By the 9th century, Buddhists had already built the world’s largest Buddhist temple in next-door Borobudur that’s made up of a central dome surrounded by 2,672 carved stone reliefs and 504 Buddha statues. They had a lot of time on their hands. And without Mount Merapi, the world would be short of two World Heritage sites. On mainly Catholic Flores in Indonesia’s east, the Nage people are buried with their heads pointing to Mount Ebulobo. 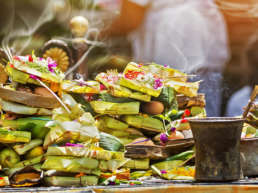 On Hindu Bali, the Balinese always sleep with their head pointing towards the religious heart of the island, Mount Agung. Not to do so invites sickness and confusion. Dig beneath this fertile, life-giving soil – and myth, religion, ceremony and mysticism are never very far away. East Java’s active Mount Bromo – its very name a Javanese derivative of Brahma, the Hindu God of Creation – is the perfect melting pot of religion, farmland and legend. 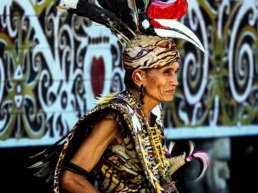 Bromo’s inhabitants, the Tengger, are an anomaly in an otherwise Muslim-dominated landscape, and are the direct descendants of the Majapahit princes who ruled the most powerful Hindu empire on Java and South-East Asia until the end of the 16th century. Today, the Tenggerese people of Mount Bromo – reduced to a population of 600,000 and living in isolated villages scattered among the Tengger mountains of the Bromo-Tengger-Semeru National Park – are a mixture of agriculturalists and nomadic farmers. And like the Hindus of Bali, they also like to mix their religion. 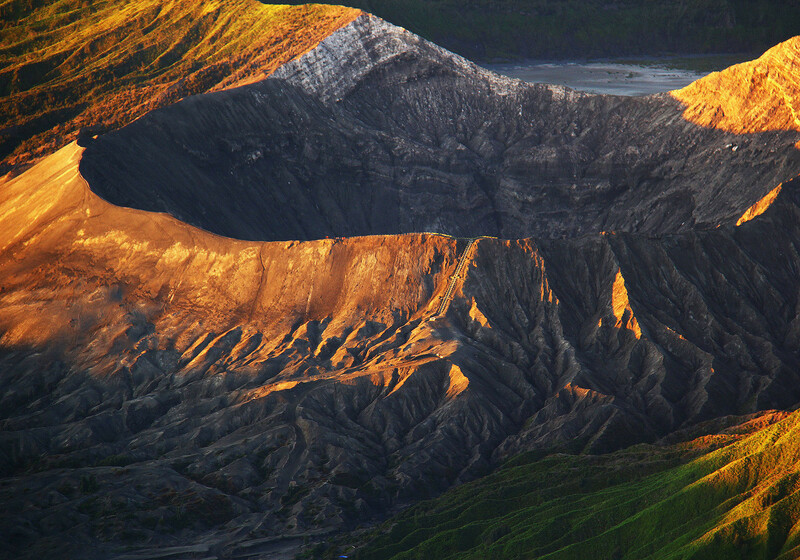 Hinduism for Bromo’s Tenggerese is almost a veneer that coats deeper layers of Buddhism and Animism. Ancestor worship is deeply embedded in their psyches, and provides the bedrock for their origins. 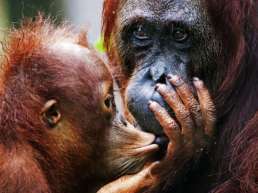 Ask any Tengger person where they come from, and they’ll tell you that they are the offspring of Princess Roro Anteng and her Brahmin husband, Jaka Seger – who fled along with fellow Hindu refugees to the safety of isolated Mount Bromo as Islam expanded its grip over Java during the 15th century. At first, all was well in the Royals’ new volcanic home. But it soon became apparent that the couple was barren. Desperate for children, they climbed to the top of Mount Bromo and pleaded for the almighty god Hyang Widi Wasa to bless them with offspring. The god promised them 25 girls and boys – but only on the condition that the 25th child be sacrificed in the volcano’s crater as a mark of gratitude. For a while, the couple forgot about their promise to Hyang Widi Wasa as their first 24 children were born. But when Prince Kesuma – the fateful 25th – arrived on the scene, the royal couple couldn’t bear to part with him. Hyang Widi Wasa ordered Mount Bromo to violently erupt in punishment, and the volcano obeyed by swallowing Prince Kesuma into its fiery mouth. And this is why, on the full moon of the 12th month of the Tenggerese calendar, Bromo’s people file religiously across the Sea of Sand to the sacred ground of Poten carrying offerings to keep their god, and their volcano, appeased. During this annual ceremony of Yadnya Kasada, money, goats, chickens, rice, vegetables, fruit and elaborate offerings of flowers – sajenan – are thrown into the smouldering, sulphurous crater to ensure the community’s safety for the coming year. 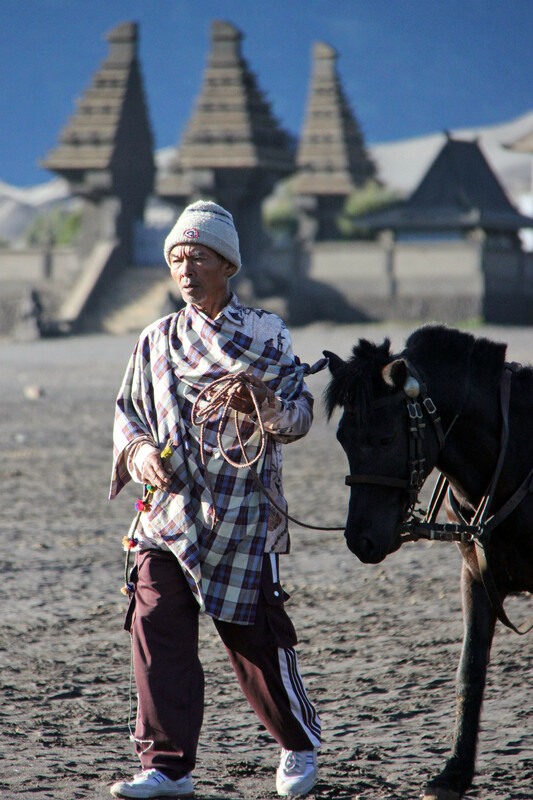 A local Tengger man, wrapped up to keep out the cold, walks his horse past the Hindu temple of Pura Luhur Poten on the slopes of Mount Bromo in East Java. The temple is the focus of the annual, colourful Yadnya Kasada. In 2006, the stoutly Muslim Sultan of Yogyakarta did exactly that. Along with his day-job of governing the bustling Central Javanese city, he also inherited the royal duty of appeasing nearby Mount Merapi’s guardian ogre, Sapu Jagat, and the fickle Queen of the South Seas, Ratu Kidul. Now Mount Merapi isn’t a volcano to be taken lightly. Its very name means ‘The One That Makes Fire’. At 3,000 meters, she ranks as one the most active and most dangerous volcanos in the world. 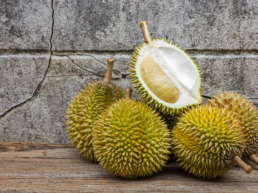 But the Sultan of Yogyakarta had grown tired of leaving the arcane annual offerings of food, flowers and his hair-clippings to placate the sea queen and her ogre mate. It just wasn’t his style. Months later, the mountain took revenge – blowing savagely in May 2006 and killing 130 people. Two weeks later, a massive 6,2 earthquake razed much of Yogyakarta and Bantul, killing over 5,400 people and displacing half a million more. 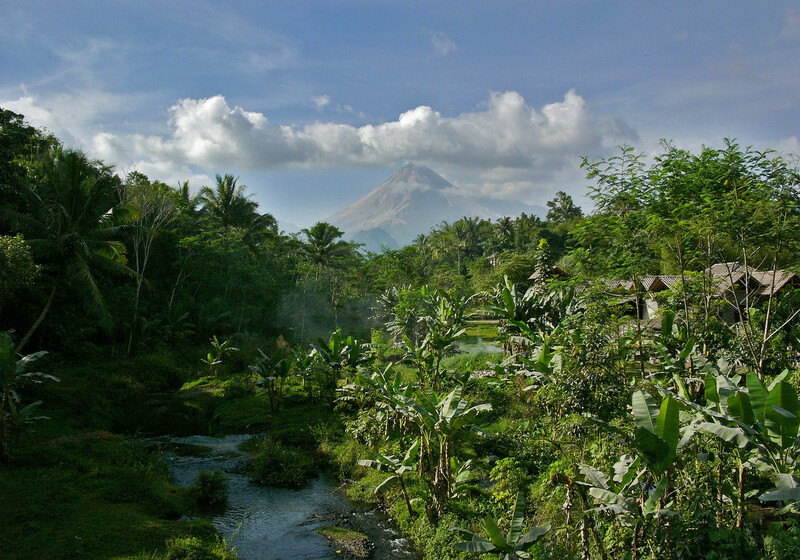 Mount Merapi stands regally in the background of this lush, tropical Javanese scene as superheated gas, ash and lava spews from its volcanic dome. Merapi is Indonesia’s most active volcano and is situated in Yogyakarta Province, Central Java. 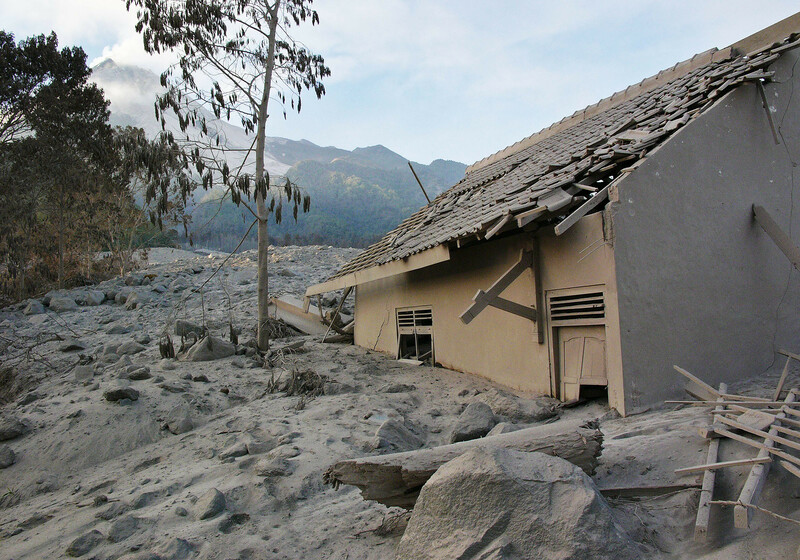 The tourist village of Kali Adem, situated high on the slopes of Mount Merapi in Central Java, lies deserted after tons of volcanic ash and super-heated lahars destroyed the village in 2006. The cone of Mount Merapi smokes menacingly in the distance. 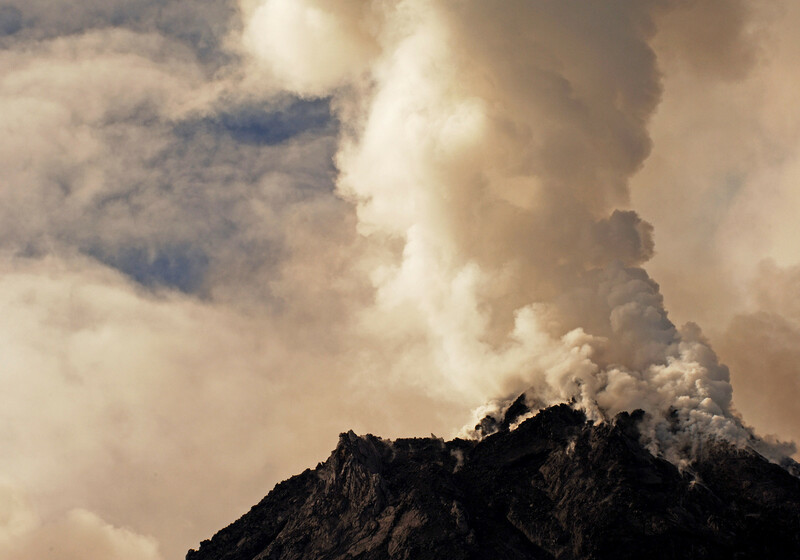 Merapi – from the Old Javanese meaning ‘The One That Makes Fire’ – rumbles back into life. Mount Merapi’s eruption in 2006 led to the evacuation of 17,000 people from its slopes; the volcano’s more recent eruption in 2010 claimed 324 lives and displaced 320,000 people..
‘Merapi’ – derived from Old Javanese meaning “The One That Makes Fire” – is an unsurprisingly popular name for Indonesian volcanoes: she has an identical twin Gunung Merapi in the Ijen Massif in East Java, and a distant step-sister Gunung Marapi (also known as Merapi and Berapi) in West Sumatra. Volcanoes are central to life in Indonesia; nowhere more so than on the famed resort island of Bali. Mount Agung – standing proud at 3,148 meters, and Bali’s tallest volcano by a kilometer – is the focal point of all Hindu life on the island. If Bali is the Island of the Gods, the mighty Mount Agung is their throne. The Balinese believe that Mount Agung grew from a fragment of rock brought over by Indonesia’s first Hindu pilgrims from the fabled South Asian mountain of Mount Meru. Mount Agung isn’t just the axis on which Bali revolves: it is, according to the Balinese, the axis of the universe. 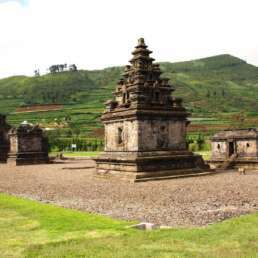 On its higher slopes sits Pura Besakih – Besakih Temple, or The Mother Temple – that narrowly escaped a major eruption in 1963 when red-hot lava flowed within meters of its walls. Despite killing 1,700 people, it was seen as miraculous that the temple was spared – and attributed to the strength of Bali’s Hindu faithful. From the top of Mount Agung and nearby Mount Batur, it’s possible to take in a stunning dawn view of Lombok’s Mount Rinjani, 100 kilometers to the east. Bali’s famous Mount Agung, standing at 3,142meters, Agung offers some serious hiking possibilities for the energetic traveller – and is the focus of all religious life for Bali’s mainly Hindu people. 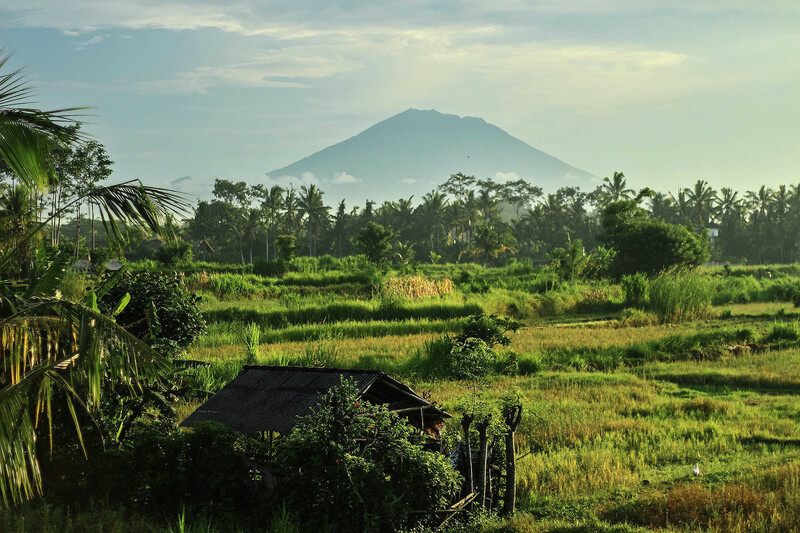 Occasionally belching small amounts of ash and smoke, Bali’s Mount Agung creates the perfect backdrop to travellers visiting the island’s cultural heart of Ubud. 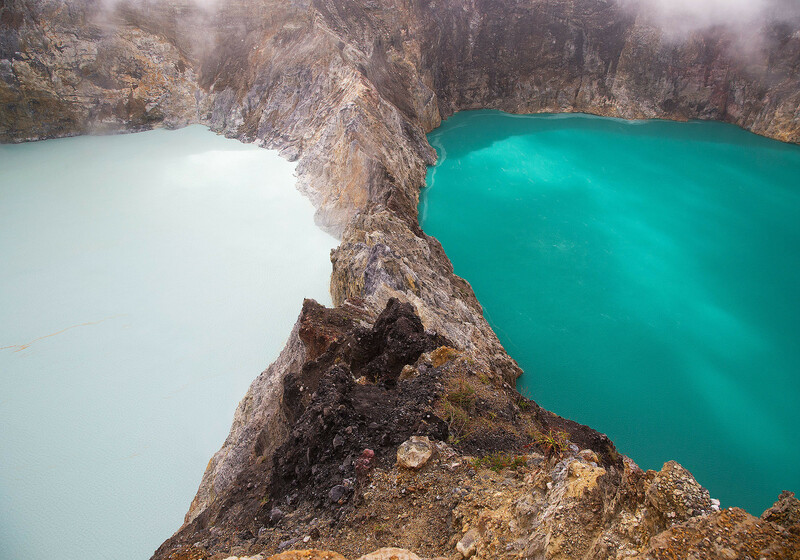 Mount Kelimutu, located on the eastern Indonesian island of Flores, is one of Indonesia’s most stunning must-sees. Kelimutu’s three coloured lakes – ranging from black or blue, green or turquoise, and an intense red – bring visitors flocking from across the globe. Highly acidic, the lakes gain their distinctive colours from a mixture of salts and oxides. Like many Indonesian volcanoes, religion and mysticism collide with geology. Local people believe that the different lakes hold the souls of the dead. The young are welcomed into the warmth of the green Tiwu Nuwa Muri Koo Fai; the old to the cold blue of Tiwu Ata Polo; and the sinful to the red or black Tiwi Ata Mbupu. In 1995, a Dutch tourist died after falling into Tiwu Nuwa Muri Koo Fai, the Lake of Young Men and Maidens. 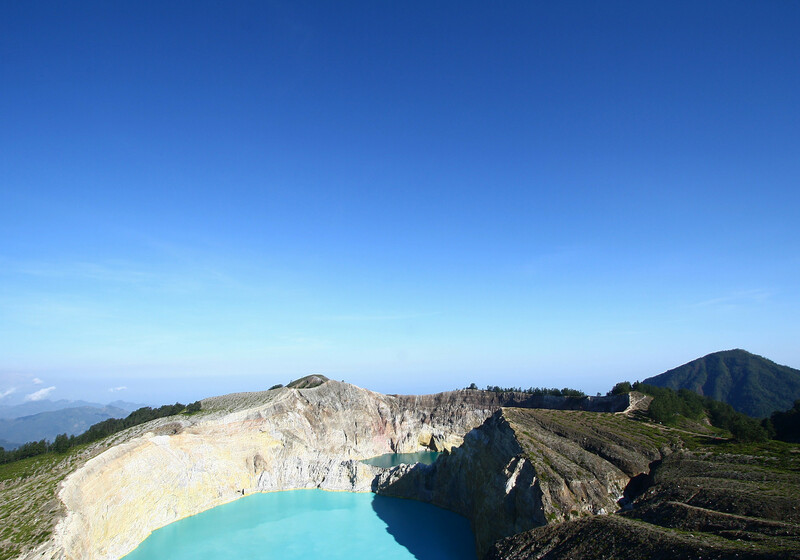 Mount Kelimutu’s craters are a draw for travellers who come to witness its three distinctively coloured lakes in Central Flores. Local people believe that the souls of the dead inhabit these unique lakes. Most travellers spend a night in the town of Moni at Mount Kelimutu’s base in Flores before hiking to the volcano’s summit for a dawn view of its three spectacularly-coloured lakes. Not all of Indonesia’s volcanos are natural born killers. Caught in a good mood, they offer the adventurous traveller some of the most rewarding hiking experiences in the world – and with views to match. After you’ve hiked an Indonesian volcano or two, you’ll never be short of after-dinner stories. Some of Indonesia’s most popular hiking destinations are Mount Bromo in East Java, and Mount Batur and Gunung Agung on the magical resort island of Bali. For hiking with a difference, try a pony-trek up Lombok’s majestic Mount Rinjani – or go out on a limb and take in Mount Kelimutu’s unique three-coloured lakes in remote Flores. 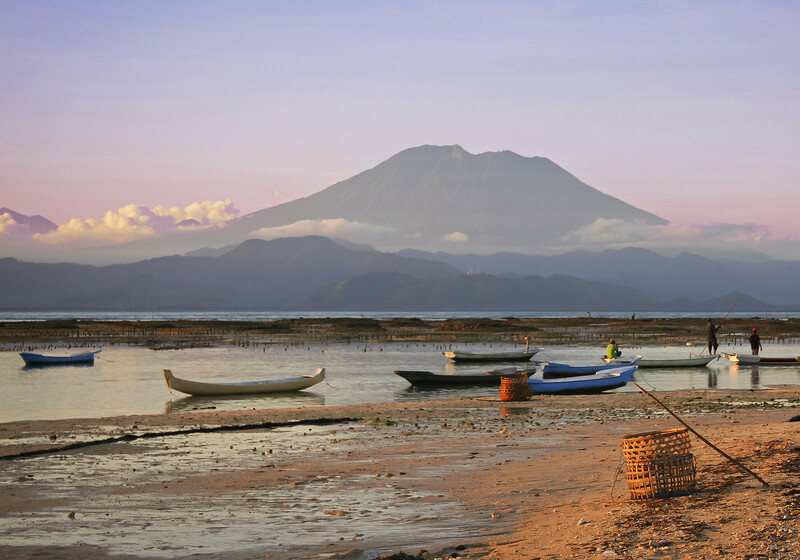 Climb into the crater of Sumbawa’s infamous Tambora volcano, or sail across to Gunung Anak Krakatau – the ‘Child of Krakatau’ – and watch history in the making. If rest and relaxation is more your thing, you can always take a dip in one of Indonesia’s countless, healing, hot volcanic springs. A reliable guide will always let you know the current status of your chosen volcano, and it’s always wise to follow their advice. Bring a good wind-proof, water-proof cagoule or jacket – it can get chilly at 3,000 meters. Hiking in flip-flops can be problematic. 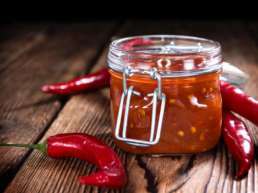 Wear solid hiking boots or bring a pair of heavyweight walking sandals – and plenty of fluids and snacks to last you the trip. A long-sleeved shirt or blouse and a wide-brimmed hat will shade you from the tropical sun, and sunglasses will protect your eyes from glare. Wear strong sun-block. 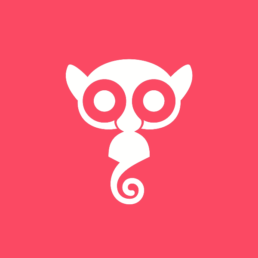 A tip from the experts? Volcanic dust is extremely fine stuff. Bring along a couple of disposable surgical masks. Keep your camera and valuables in a dry-bag when you’re not using them – and if you’re serious about photography, you might want to bring a portable, lightweight tripod for those one-off night shots. If you’ve always fancied yourself sitting on top of a volcano watching dawn appear, you’ve come to the right place. Volatile. Sleepy. Stunningly dramatic. Life-givers. Life-takers. You can’t get more extreme than that. A well-prepared hiker skirts the sandy lip of Bromo in East Java. Despite their fiery reputation, many of Indonesia’s volcanos provide stunning backdrops to a highly memorable hiking trip. Mount Anak Krakatau, Sunda Strait: Very definitely active, this volcano has erupted as recently as 2012 – previous eruptions were recorded in 2011, 2010 and 2009. Check with your local tour guide who will advise on its current status. Mount Sinabung, Sumatra: As this extremely active volcano has been erupting since 2013, this volcano is not currently approachable. Mount Tambora, Sumbawa: Standing at an impressive 2,460 meters, Tambora is eminently hikeable: its last eruption was in 1967… and 1880. Safe for trekking. Mount Merapi, Central Java: Despite violent eruptions in 2010 and 2006, Merapi is currently safe to climb – but check first with your local guide. Mount Bromo, East Java: Bromo erupted most recently in 2011 and 2000, but is currently hikeable – please check with your local guide in advance. Mount Agung, Bali: This is definitely one of Indonesia’s safer volcanoes as it last erupted in 1963, but at 3,142 meters it’s not a hike for the faint-hearted. Mount Batur, Bali: One of Bali’s most popular hiking destinations, dawn views from the summit often reach to neighbouring Lombok. It last erupted in 2000, 1998 and 1994. Mount Rinjani, Lombok: Favoured by hikers, and higher than Bali’s Mount Agung and Batur, you can also trek up this 3,726-meter active volcano on a local pony. Rinjani last erupted in 2010, 2009, 2004 and 1994. Mount Kelimutu, Flores: Dawn views are spectacular and very popular with hikers; its three-coloured lakes are a traveller’s hotspot. Last erupting in 1968 and way back in 1865, Kelimutu is considered active but reliably safe. Mount Semeru, East Java: At 3,676 meters the highest volcano on Java, Mount Semeru is also extremely active – it hasn’t stopped erupting since 1967. Not one for the itinerary, and currently considered dangerous. The Dieng Plateau, Central Java: Di Hyang – meaning ‘Abode of the Gods’ – is a marshy plateau on the floor of a caldera, and its volcano erupted in 2011, 2009 and 2005. Check in advance before you hike this one. Mount Slamet, Central Java: This large, active volcano erupted in 2014 and 2009, and is to be approached with caution. Mount Sangeang Api, Lesser Sunda Islands: Considered extremely active as it last blew in 2014. Best viewed from afar. Mount Marapi, Sumatra: Not to be confused with Mount Merapi on Java, Marapi is the most active volcano on the island of Sumatra. It hasn’t stopped erupting since 2011, and it last blew in March 2015. One to admire from afar. Mount Soputan, Sulawesi: With a fresh explosion in March 2015 that sent pyroclastic flows 2,5 kilometers down its slopes, this is definitely one to miss for the moment. Mount Paluweh, off Flores: Also known as Rokatenda. Quiet since 1985, a recent eruption in 2013 means that it should be approached with some caution. Mount Lewotobi, Flores: These twin volcanoes – meaning ‘husband and wife’ – are an active pair, but Lewotobi hasn’t blown since 2003 and is currently considered a safe hiking option. Mount Ebulobo, Flores: Classed as ‘restless’, this remote 2,124-meter volcano hasn’t erupted since 1969, and is currently safe to climb. Mount Batu Tara, Lesser Sunda Islands: Batu Tara, a small stratovolcano situated way out east near Timor, has just begun a fresh series of eruptions despite last having erupted in 1852. View from afar. Mount Kelud (also Kelut), East Java: Highly active for more than three centuries, Kelud last erupted in 2014. Visitors are not advised to approach the crater rim. View from afar. Borneo is huge. After Greenland and New Guinea, it's the third largest island - and two thirds of it belongs to Indonesia. Straddling the equator, and split politically by Indonesia, Brunei and Malaysia, Borneo sustains one of the richest ecosystems on the globe.